On the surface, choosing a WordPress theme is a simple enough proposition: Find a theme with a look you like that matches your brand aesthetic and you’re good to go. 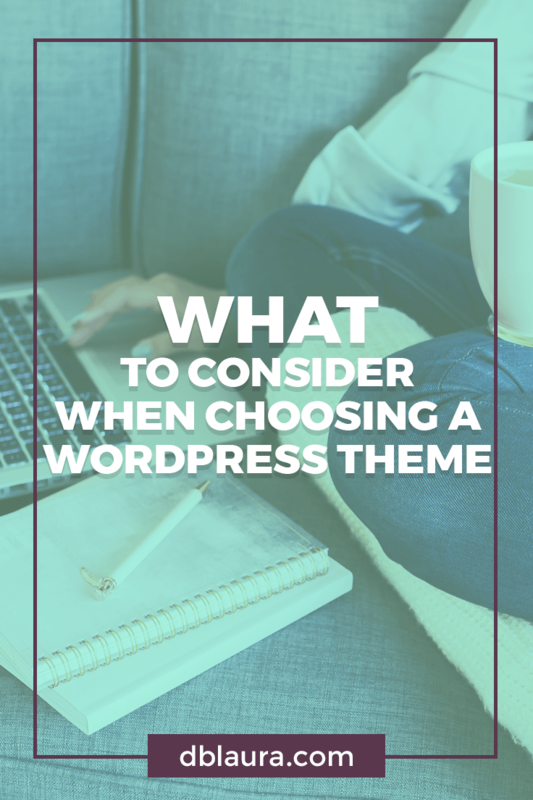 But while the primary purpose of a theme is to dictate how your website is styled, there is much more to consider than just how good it looks. How much control do you want over the look of your site? Do you want a theme that looks like the demo straight out of the box, or do you want to be able to alter certain elements to your specifications? Some themes, like Divi which I use, are highly customizable. Others allow customization of colors and particular layout features. Still others offer minimal customization, and essentially look how they look. Of course, provided you’re comfortable editing your site’s CSS, even those themes can be customized. Determining how much you want to be able to change on your own is one of the major considerations that go into choosing a theme. Many themes come bundled with plugins that perform particular functions. Usually, the theme and plugins are developed by the same company, or the theme developer has an affiliation with the plugin developers. This is great if you have specific ideas about what you want your site to do, and so can get the look and the function in one fell swoop. But, remember, you can always download plugins separate from your theme to get the functionality you want. Check out this post on plugins to get my recommendations on must-have plugins for ultimate site function. What kind of website is your site? Some themes work best for certain types of sites. Themes for blogs, themes for online shops, themes for portfolios, themes for online magazines. If you expect your website to have a standardized layout, going for one of these type-specific themes is a good choice. Looks aren’t everything, but they do deserve consideration, especially if you don’t want to do a lot of your own customization. There are theme developers dedicated to creating feminine themes, funky themes, really, themes with just about any adjective you can think of. Take your time to determine exactly the look and feel you want for your site if you’re going to choose a theme based on its style. Hard as it is to believe, there are still WordPress themes created without being mobile responsive. Considering how many people access the internet from their cellphones and/or tablets, it makes no sense to use a WordPress theme without mobile responsiveness. Don’t do it. Even if a theme ticks every other box on your must-have list, if it isn’t designed to be responsive, it doesn’t get used. It is completely possible to get a great WordPress theme for absolutely nothing. It may not have all the bells and whistles, but it will look and work great. It is also completely possible to get a great WordPress theme for thousands of dollars (in this case, you’re usually paying for exclusive usage). In this case, it will likely have plenty of bells and whistles, plus a load of support and other bonus features. What you pay for your WordPress theme is really up to you. It isn’t difficult to find a good WordPress theme. What’s hard is choosing between all of the awesome ones available.